I know, I know, I know. It’s MAY. Which is more than officially spring. I should be posting fresh asparagus recipes, or greener than green salads, or something fresh and colorful, right? Instead, I have chili. Seriously? In May? But yes, chili. See spring is a rather evil season in most of the northern part of the US, especially this year. It’s been a fickle and bitchy season — teasing, taunting, and often freezing. So after spending a few days outside last week in this capricious weather, I am offering a mild and tasty chili (no 18 types of peppers in this version), made lighter with lean bison rather than beef, with a good mix of spices to warm you up and yet not remind you of winter. Hopefully. 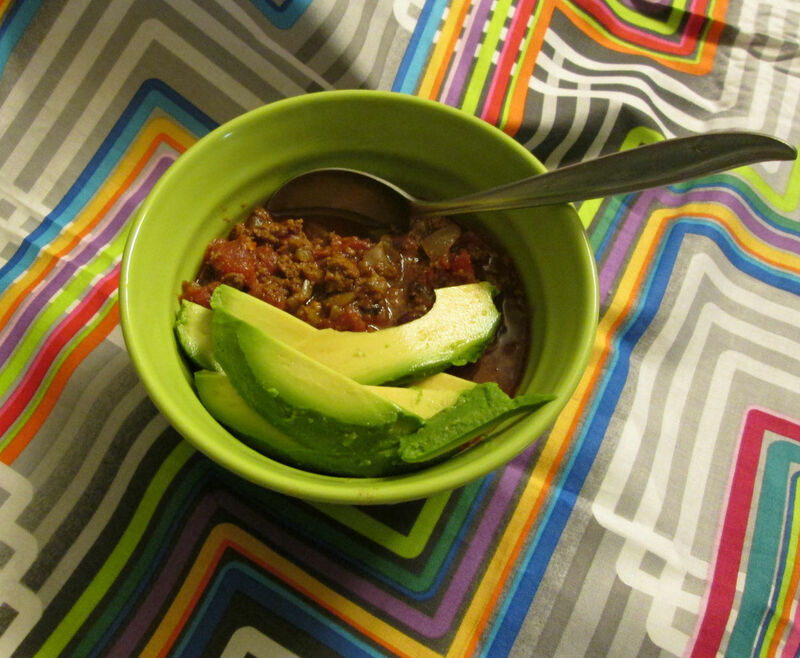 Oh, and if you want to vegetarianize the basic chili spice recipe here, I think TVP reanimated with mushroom broth might make a good substitute, but I didn’t try it because of the soy allergy. If you give it a go, will you let us know in the comments? Mmmm, spring chili. Why not? Heat a large stock pot over medium heat. When the pan is hot, add the oil and let it heat until shimmering. Add the onion and salt, cook until translucent. Then add the peppers, cook for another minute or two, then add the garlic if you’re using fresh garlic. Stir well. Add the meat and break it up as it cooks. When the meat is broken up well and mostly cooked, add the dried seasoning (add garlic powder here if you’re using that). Add the beans, stir well, and then add the tomatoes. When the mixture is at a low boil, turn it down to low and simmer it for at least 40 minutes. Add toppings and serve! 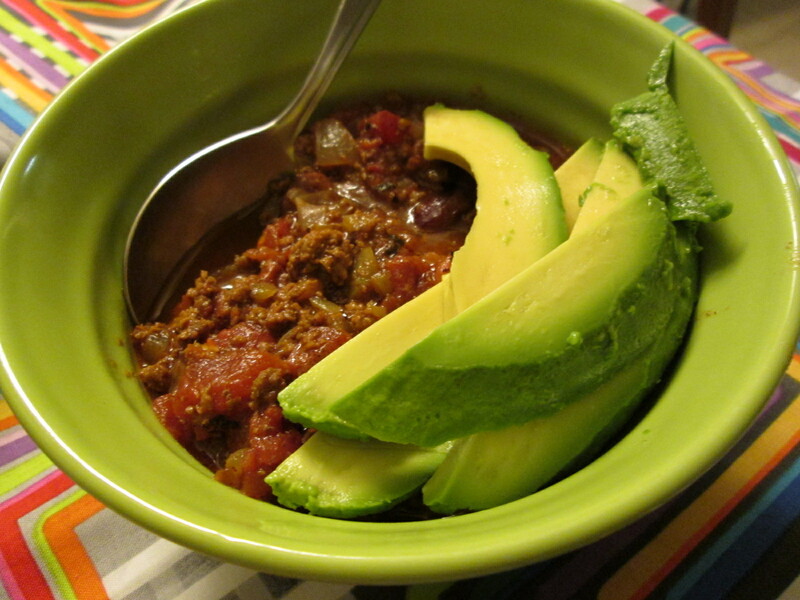 This chili really benefits from a little avocado on top — I think the richness and “green” flavor compliments the lean meat (add just a pinch of kosher salt to the avocado to make its flavor really pop). Leftovers are pretty great over baked sweet potato. **This spice blend contains sesame. You can leave it out.